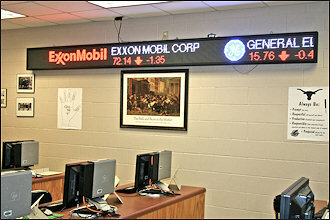 Entech Signs has numerous LED Tickers available: Stock Tickers, Sports Tickers, News Tickers, Entertainment Tickers, and Custom Messaging LED Tickers. LED Sports Ticker Service includes current odds, scoring updates and breaking news stories from the world of sports! Every morning odds and game times are updated for every major event for that day. At game time, we begin to broadcast "live" scores, followed by the final game scores and summaries. During a busy sports day, we will update news and scores hundreds of times! ENTECH SIGNS cover the NFL, NBA, NHL, MLB, NCAA Top 25 (football and basketball), PGA, LPGA, SPGA, NASCAR, Formula One and all major events such as the Olympics or World Cup. All this, and you still have room to enter your own messages. 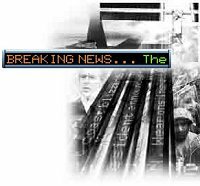 LED News Ticker Service includes 24 hour a day, seven days a week, comprehensive broadcasts of breaking news and leading stories from each news category. ENTECH SIGNS delivers fast, reliable breaking news stories from every corner of our world. The "INDICES package" is ONE file add-on to any existing service that a customer may already have. This file displays the DOW JONES - NASDAQ and S&P500 INDICES sent every 30 mins while the markets are open. 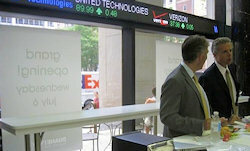 The "FINANCIAL package" is a FULL news feed that includes the "INDICE package" above as well as a listing of all 30 stock symbols that make up the DOW JONES - Top Gainers, losers and most active stocks from the NYSE, NASDAQ and AMEX. We also provide Currency rates that compare the US Dollar with the Canadian Dollar, Japanese Yen, Euro, and British pound. 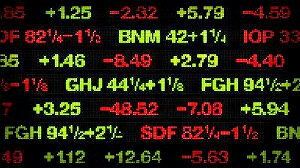 Along with the US Indices we also provide World Indices that include the Nikkei, Hang Seng, Dax and TSE300. There are also Market News stories interspersed throughout the sign. We have custom tickers available. Available in various lengths and heights. Mono, tri color and full color units available. Call for a quote.